"Surprising simple and refreshing! I don't use the blender piece as my pitcher for this drink but feel free to do so if you wish." 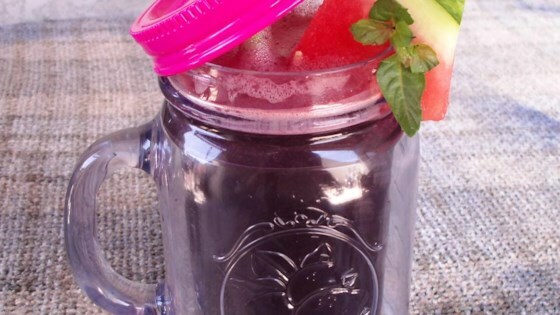 Blend the watermelon in a blender until smooth; pour into a large pitcher. Stir the water and agave nectar together in a small bowl; add to the watermelon. Stir the tequila into the watermelon mixture. Add the blueberries and garnish with the mint to serve. Not a favorite of mine, but my family really liked. Will probably make again for them. I omitted the frozen blueberries and mint.